Stainless steel clamping levers and a load capacity of 2500 lbs. The GENEQ AIR METER is one of the most precise air measuring devices available for concrete. 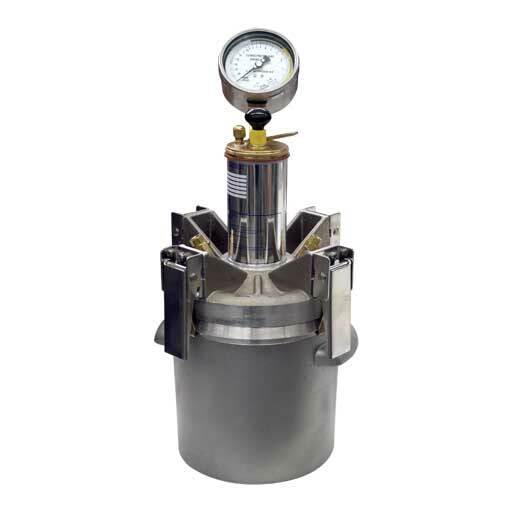 With heat treated cast aluminum construction and cast in handles on base, GENEQ AIRMETER is heavy duty, yet lightweight, and easy to handle. Our unit utilizes the best clamping system available, with large stainless steel clamp levers and a holding capacity of 2500 lbs. each. This clamping system provides easy, dependable operation.Employing the use of a superior high volume Ultra PumpTM, this system makes operation rapid and easy. 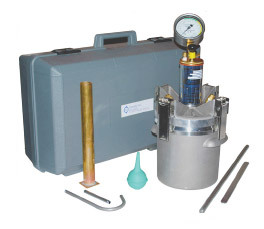 This includes a larger, more accurate pressure gauge, bourdon tube, and an easy reading color dial face coded for entrapped and entrained air. Precisely molded polyethylene case with inner molded reinforced walls to hold the meter and accessories in place. Bowl and meter cover stored apart to eliminate bowl from bonding with cover gasket. Case designed to fit all pressure meters except Type A ( Protex) Meters. Light weight, long life, rust-free!